Bolton Wanderers manager Owen Coyle has appealed to striker Daniel Sturridge not to return to Chelsea to sit on the bench but stay at the Reebok to play first-team football. The 21-year-old has enjoyed a successful spell with the Trotters scoring eight goals in 12 appearances. Coyle believes the progress the England U21 international has made this season will be lost if he returns to the Blues’ bench and does not continue his development. With Chelsea still to appoint a replacement for Carlo Ancelotti, it remains unclear whether he will be in the first-team reckoning next season. 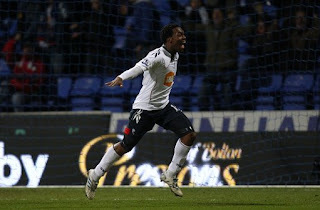 Coyle wants Sturridge to develop his game in another loan spell at the Reebok Stadium next season.